The Department of Sculpture, established in September 1981 has undertaken more than a dozen research projects and brought out a four-volume Encyclopaedia of Hindu Iconography with Dr.Raju Kalidoss as Chief Editor. Concentration of research is mainly on the impact of Bhakti literature on the art and culture of India, in general and those of the State of TamilNadu in particular. Apart from facilities for doing research towards M.Phil. and Ph.D., the Department has a P.G programme in History, Art and Culture. 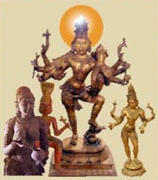 => To study the features of temple sculptures in the light of the devotional hymns of the Nayanmars and Alvars. => The Department has organized 20 seminars, workshops and refresher courses. => The faculty members have so far published 10 books. This page was last modified on 9 November 2015 at 14:11.